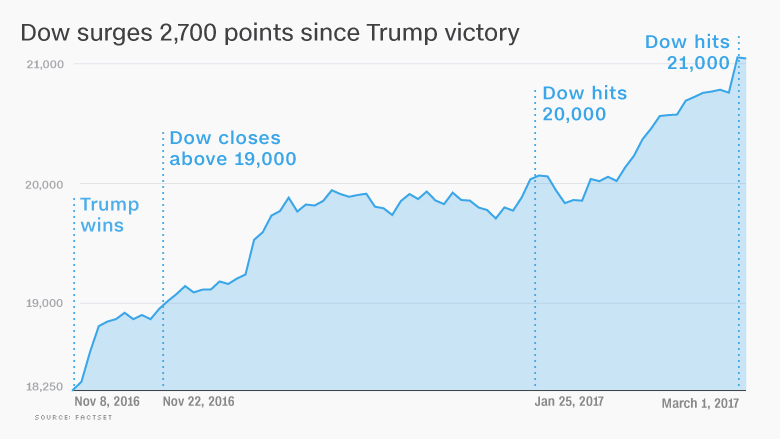 The "animal spirits" unleashed in the stock market by President Trump's victory have lifted the Dow an incredible 2,700 points in less than four months. The Dow has set 32 record highs since the election. This week, it crossed 21,000, tying a record for the shortest period between 1,000-point milestones. Now investors want to know: Will this historic rally continue, or is it destined to disappoint? A lot has to go right, in both Washington and the U.S. economy, to justify the meteoric market rise. That's because the gains on Wall Street have been built mostly on expectations and optimism, not fundamentals. Stocks are more expensive by one measure than at any time in the past dozen years, and CNNMoney's Fear & Greed Index is flashing "extreme greed." Clearly, hopes for the Trump agenda of tax reform, deregulation and infrastructure spending are very high. But Trump's ambitious proposals are not even close to being implemented. The complexity of tax reform, and problems with figuring out Obamacare first, threaten to slow the process further. "The market is putting an increasingly large down payment on expectations of policy, which has a risk of not developing as hoped," said Mark Luschini, chief market strategist at Janney Capital. "The market is vulnerable to disappointment," he said. Understandably, investors are cheering a post-election spike in confidence among consumers and CEOs alike. While that's encouraging, the key for corporate earnings is whether the confidence translates into real spending -- by Americans, online and at the mall, and by CEOs on equipment, factories and workers. But there's no guarantee that spending will follow, especially considering the deep uncertainty about taxes. 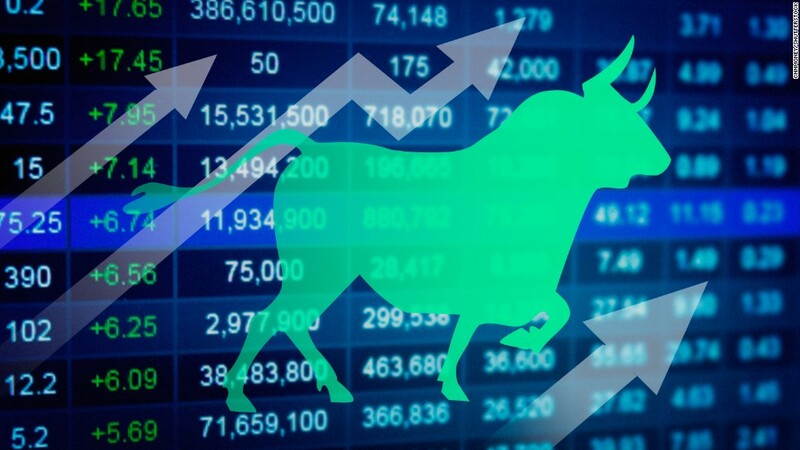 "All the optimism in the world doesn't change the numbers here and now," Michael Block, chief market strategist at Rhino Trading, wrote in a note to clients. "I worry that we are heading for a big letdown here." The market euphoria has made stocks pricier, at least in historical terms. Based on Wednesday's close, the S&P 500 is trading at 17.9 times projected earnings, the most expensive since April 2004, according to FactSet. Even notoriously optimistic Wall Street stock pickers are struggling to keep up. Just look at Bank of America Merrill Lynch, which had been calling for the S&P 500 to rise to 2,300 by year's end. But the index is already sitting at nearly 2,400. BofA upgraded its target to 2,450 this week, but it warned in a report that "elevated valuations" have created "more risks than were evident a few years ago." Luschini, who had predicted the S&P 500 would rise to 2,410, also sounds uneasy about how fast the market has risen. "We were one of the most bullish on the Street. It looked pretty ambitious back in December," Luschini said. Asked at what point he would be concerned the rally is overdone, he said, "A month ago." Much of the focus now will be on Trump's efforts to rewrite the corporate tax code. Investors are already banking on dramatic tax cuts that will translate to fatter corporate profits. Look for the Trump rally to falter if it starts to look like tax reform won't get done this year as promised. Some believe that timetable may be too ambitious, especially considering the divide over whether to adopt House Republicans' proposal for a so-called border adjustment tax, meant to encourage more companies to make things in the United States. Trump has also indicated Obamacare needs to be repealed and replaced before taxes can be tackled, but that is providing to be easier said than done. Speaking at an investor conference this week, JPMorgan (JPM) CEO Jamie Dimon said that tackling Obamacare first will "clearly delay tax [reform] and maybe make it harder to get something done." In a best-case scenario, if Obamacare comes first, tax reform will take a year, Dimon said. Wall Street is also increasingly betting on an interest rate hike from the Federal Reserve later this month. If the Fed fails to deliver, it could leave investors disappointed and wondering once again: If not now, then when? And of course, the Trump rally depends on the American economy withstanding the policy uncertainty to keep corporate profits from falling. Wall Street economists are calling for U.S. growth to pick up above a 2% rate in the first quarter. However, the Atlanta Fed's GDPNow model was recently downgraded from 2.5% to a mere 1.8%. "I don't think the market can withstand weak economic news," Luschini said.